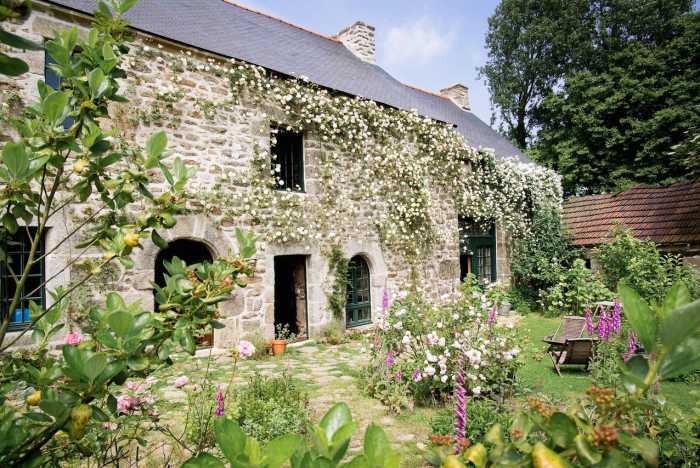 Properties for sale in Brittany, France - AHIB-1-PI-2227 22330 Le Gouray. Stunning 15th Century Manoir. Character, with 5 bedrooms & galleried lounge. cottage garden, with a stream. AHIB-1-PI-2227 22330 Le Gouray. Stunning 15th Century Manoir. Character, with 5 bedrooms & galleried lounge. cottage garden, with a stream. 2600m2. If you are a lover of old, character houses, this wonderful example should be a must see. Parts of it date from the 15th century, and like many houses that have seen and heard so much about over time, there is a real "feeling" of history inside. I read something once that said"ancient walls that sing the distant hours" - that could have been written for this house! It may be old, but inside it is warm,light, comfortable andvery spacious, an old house, suited to modern living. The current owners have restored it with love and taste. You enter via the kitchen, no fitted units here, but room for everything. A gas fired range for cooking and heating and a fireplace for extra warmth. Through the arch into the stunning lounge, with its fireplaces, and double height ceiling with galleried landing all around. On the first floor, the bedrooms are divided to the left and right. To the left you will find 3 double bedrooms, a bathroom and toilet. There's a cosy, cottage feel to this area. Below is a laundry/ store room, that can be accessed by an internal staircase, or an outside door. To the right you will find an unbelievably romantic master bedroom, a large bathroom, then an office, that would make another bedroom, if required. On the second floor is the fifth bedroom, sitting snugly under the eaves. If you are thinking of running a B&B, this house would suit, as you could have a guest wing, & a private wing. The second floor bedroom would also convert to a guest lounge if you didn't want to share the downstairs lounge. I'm sure there are many future guests who would love to stay here. Outside to the front is a cottage style garden, very fitting for the house. At the back its mainly lawn, with a surprise...it leads down to a small, winding stream. Idyllic in the summer. To the right of the house is a workshop, if you are looking for a project, this would convert to living space, you could knock through into the kitchen. A bigger project would be converting the ruin next to the house into accommodation (subject to planning etc.,). All around is quiet and calm, the house is on a no through road, at the end of a small hamlet. 5 minutes from the village of Le Gouray, 15 minutes from the market town of Lamballe. If you can bear to leave this paradise for longer there are many lovely places and attractions close by. So, if you love ancient walls and like to feel history & heritage then add this property to your viewing trip come a see this house. Its a rare thing - and special, very, very special.